The fashion industry is finally starting to wake-up to the fact that age is not just a number, it is the portal to profit. The ever-increasing longevity of human beings means that there are many diverse generations of potential fashion customers and most are virtually ignored. The current obsession with Millennials (Born 1975-1995) is symptomatic of the now obsolete belief that only the younger generation is receptive to fashion. Thus, the runways and magazines are populated with Millennial models and celebrities, often decked out in outfits that only emaciated young Amazons could possibly carry off. Tunnel vision focused exclusively on youth excludes several generations of potential fashion consumers. For many women, fashion is a life-long passion and that fact is opening up opportunities for age diversity. Baby Boomers, once thought to be perfect potential fashion consumers, are now almost invisible. Yet they remain poised to spend, the wealthiest generation that has ever populated the planet. And the WWII War Babies are still shopping, too! Recently, 94 year old Iris Apfel, eccentric NY fashionista, was the toast of Paris, seen at fashion shows, on a giant billboard on the Champs Elysee and the subject of an exhibition at Le Bon Marche department store. Women’s Wear Daily featured her on the cover of their Paris Fashion Week issue rather than a designer collection story, a very surprising editorial choice. At the same time came the launch of a new magazine “Vogue ME” a spin-off from Vogue China aimed solely at the 25 year old consumer. 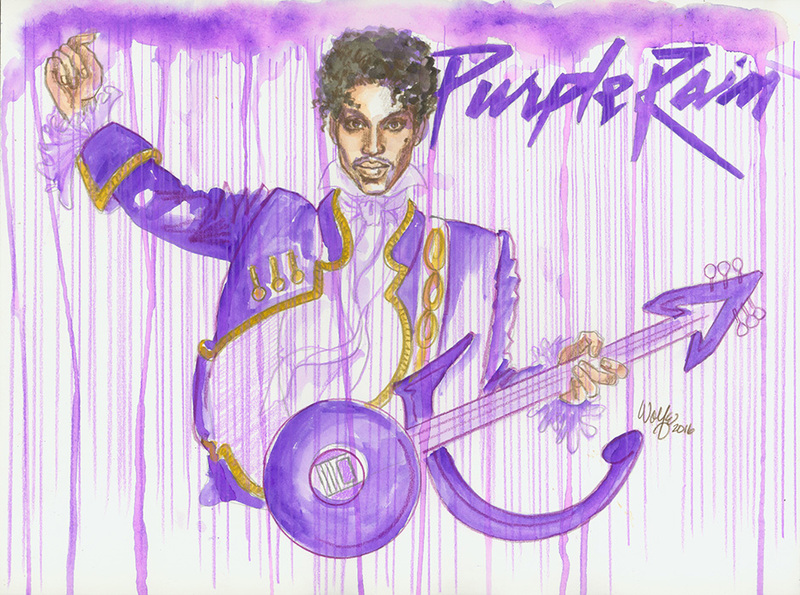 Co-existing examples that generational marketing of fashion is viable. Giorgio Armani launched a new, more “realistic” range of clothes called “New Normal” and used gorgeous middle-age models for the advertising campaign. Yasmin LeBon (51), Eva Herzigova (44), Nadja Auermann (46) and Stella Tennant (46). They are now considered to be too old by fashion magazine editors but it’s obvious that they are definitely not past their prime. Multi-generational fashion is the solution to the problematic fashion industry today. 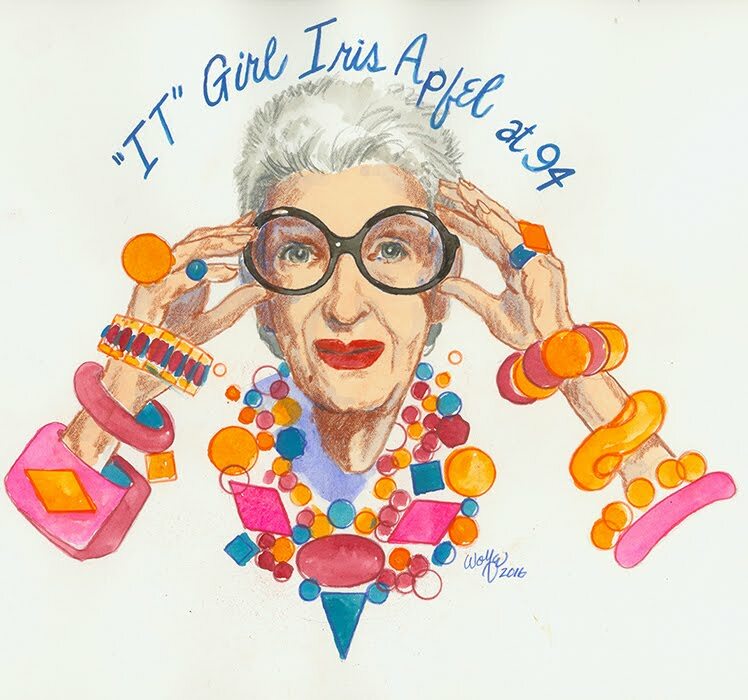 My sketch of 94-year-old fashionista Iris Apfel. Chinese “Me” Vogue for 25 year olds. Armani’s “New Normal” supermodel campaign for Gen X and Boomers. My fascination with movie-making never wanes and I was enthralled to add yet another book to my huge collection of Hollywoodiana. (OK, so there’s no such word.) 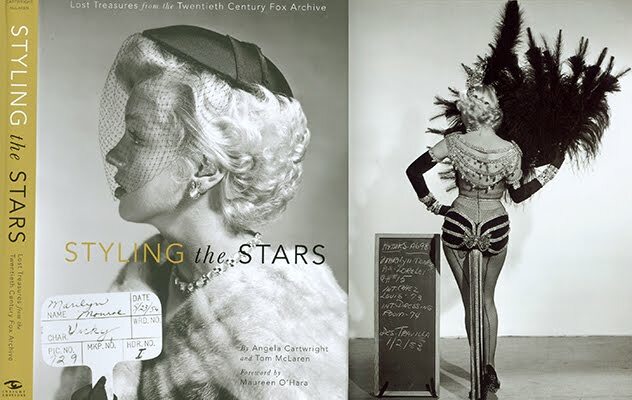 “Styling the Stars” was published in 2014, but I just discovered it and poured over the 300 page volume of production stills that have been long forgotten. The photographs were taken to be used by hairdressers and make-up artists as well as the wardrobe department. 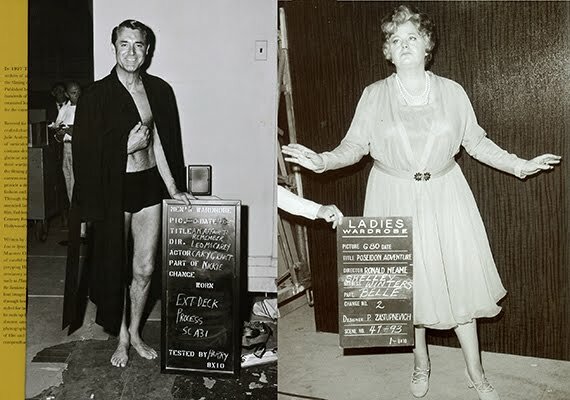 To make sure these unretouched working references were never to be published, the stars were shot standing next to or holding a sign, sometimes holding a comb or brush to signify that the reference photo was to be sent to the appropriate department. This fascinating glimpse into workaday studio production, originally $75, is available from amazon.com for $47.94 or less. Marilyn Monroe testing a hat and wearing the “Diamonds are a Girl’s Best Friend” costume rejected by the censors. The Fall ’16 fashion shows once again put leopard in the limelight. Season-after-season, leopard prints parade up and down the catwalks (so appropriate!) Scores of designers continue to discover new interpretations to keep spotted cats on fashion’s cutting edge. But remember, not every spotted cat is a leopard. Leopard spots are dark rosettes with no central spot in the center. Jaguar spots are similar but have a central spot (like the stamen in a flower). Cheetah spots are small, densely-spaced solid-color dark spots. Nowadays, virtually all the spots are printed on fabric or fake furs. That was not the case in the past before eco-concerns raised consumer consciousness, decades ago when affluent women wore spotted furs. The appeal of leopard seems to be ever-lasting in all areas from high fashion designers to mass-market merchants and currently shows no sign of reaching saturation. 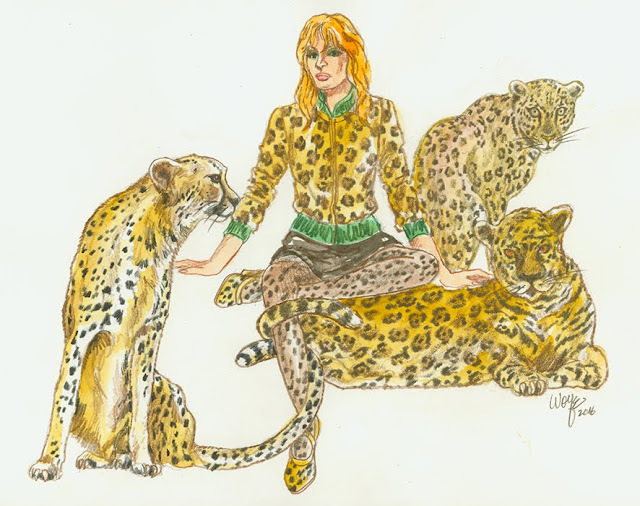 My Sketch of spotted cats who inspire fashion. Queen Elizabeth, Jacqueline Kennedy and Liz Taylor wearing real fur coats, decades ago. Jean-Paul Gaultier’s embroidered pelt gown, 1997. Identify the spotted cat natural patterns. I am a devoted fan of “Outlander,” the mini-series that turns time-travel and 18th century history into a popular, passionately romantic TV mini-series. 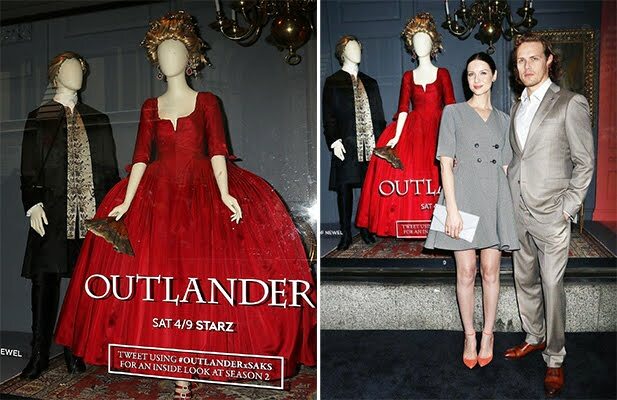 Saks Fifth Avenue recently celebrated the series’ new season on the STARZ network by displaying costumes in their windows and featuring the stars on the cover of the store’s catalogue. The tie-in created an exciting photo op on Fifth Avenue with the crowd-pleasing appearance of the stars, elegant time-travelling Caitriona Balfe and Highland hunk Sam Heunghan. The second season of the series takes the characters from Scotland to France. The lavish costumes for ladies and gentlemen of the period, (10,000 in fact!) designed by Terry Dresbach, just might set a trend and inspire some contemporary designers to copy the fancy fabrics (several hand-painted), extravagant trims, jeweled buttons and ornamental accessories and shoes. 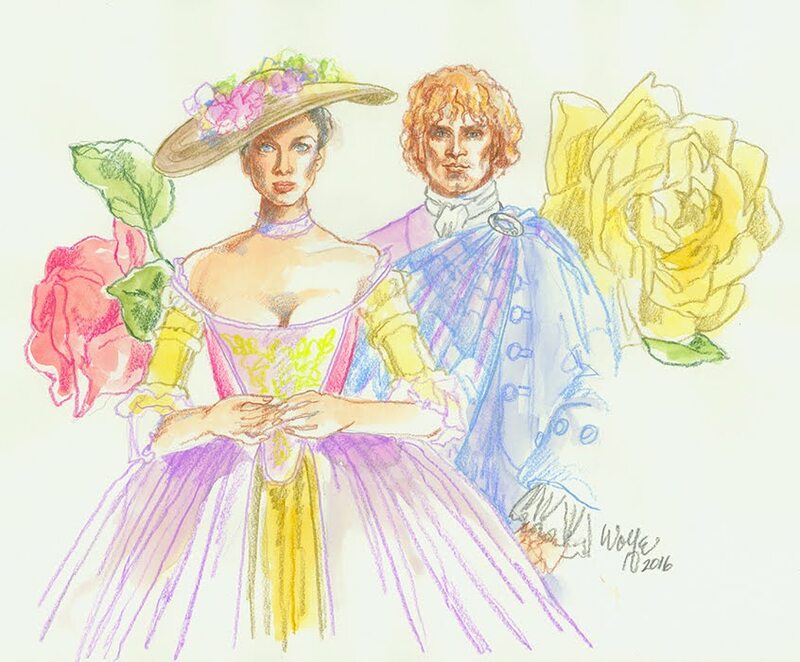 My sketch of the “Outlander” stars. “Outlander” stars step-out in front of tie-in windows at New York’s Saks Fifth Avenue. Close-ups of extravagant fabrics and trims. 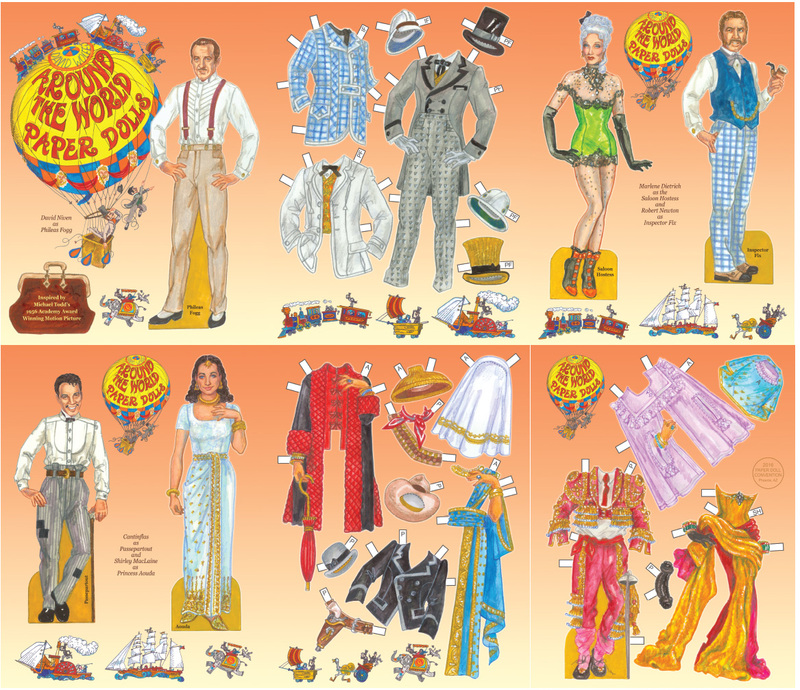 Jenny Taliadoros and I volunteered for the responsibility of concepting, initiating and printing the souvenir paper dolls to be given at the Phoenix Convention in June. Many artists were invited to participate and the resulting souvenirs are splendid as you will see next month if you are attending the convention hosted by Jane Alfano Rasor or if you have ordered the Absentee Package (See below for more information). I suggested an idea for me to create a paper doll book inspired by the 1956 movie, “Around the World in 80 Days,” the perfect tie-in for the convention’s theme, “Around the World with Paper Dolls.” The film was a smash hit and won the Academy Award for Best Picture. Following is a special pre-convention copy of the souvenir book I created, a sneak preview for you. To Order the Absentee Package, priced at $100, and receive the five souvenir books, menus and coloring book, click here for the Souvenir Flyer or email convention host Jane Alfano Rasor at Jane.Alfano@Rasor.org.